Last year I heard a National Public Radio interview with Louis Ferrante. His story interested me so much I had to buy his book and learn more about his life and point of view. Ferrante, a former mob associate, wrote a book after retiring from the life. Last year I heard a National Public Radio interview with Louis Ferrante, the author of "Mob Rules, What the Mafia can Teach the Legitimate Businessman." His story interested me so much I had to buy his book and learn more about his life and point of view. Ferrante, a former mob associate, wrote this book after retiring from the life. So, Isn't All Bodywork The Same? This is a question that all massage therapists and bodyworkers around the world have heard at one time or another in their career. It is a question that we will chuckle over when having a drink with fellow body aritsans. The answer to us is obvious. On Sunday 13th February 2011 in Cumbria, Sensei Mike Ilderton & myself held a self-defence seminar & inter club Kata competition. Mike also assessed 6 Brown belts whom hopefully will attain Black belt status in May of this year in Newcastle. The course started well with 30 juniors & 6 adult students filling the training hall in the little town Barrow. During the annual Bethany Beach Residential The Martial Arts Learning Community (TheMALC) board of examiners evaluated three candidates for promotion. Heading the evaluation team was Senior Instructor Liam Brady of Brady Kenpo Schools Dublin, Ireland. Other examiners included Professor Dennis Lawson of www. On May 4th, 2010 JJ Simon, Melvin Ruth and I traveled to Baltimore, Maryland to participate in the "Get Motivated" Business Seminar. There were several speakers with topics ranging from Goal setting, Motivation, Financial Savvy to Leadership. The best speaker that day was General Colin Powell and his speech was about Leadership. On Sunday, we set off to Cumbria to visit Helen and her students. The early sunshine gave some credence to the rumor that spring had arrived in Newcastle. When some 40 miles from Helen we hit the fog and we were back to winter! We were subsequently a little late and found the hall full of Helen's students. Recently, I had the privilege of attending the AWMAI (Association of Women Martial Art Instructors) conference. This conference stood out from other conferences I've attended in the past for a couple of reason; not only was it a conference geared for instructors, it was held while cruising the Bahamas. We headed out of the Port of Miami on Monday, January 4. Tuesday, December 15th, World Martial Art's Training Day. It is a time to renew our love for our Art, our love for training, and to honor Mr. Parker and his legacy. Recently a few of us expressed interest in learning how to shoot rifles and with Dennis' encouragement Melvin Ruth was kind enough to put together a Long Gun Training Course for us. Lena, Nora, Dennis and I came to our first class not knowing what to expect, but very eager to learn. Most of us had no experience with weapons at this point. 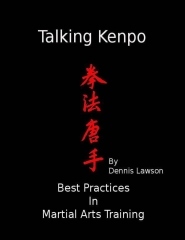 On June 13, 2009, at Paston Ridings Primary School in Peterborough, United Kingdom, Peterborough American Kenpo Karate presented ‘One Big Seminar 2009′. Here is a review of that event. Saturday morning Keelan and I headed South to Peterbrough, some 200 miles from Newcastle. Lena Varuolo (TheMALC Director of Information Technology) and I arrived in Dublin on Saturday morning April 11th. After settling in we worked a bit with Liam Brady, Gerry Lynch, and JJ Kelly on the principles of Self-Defense --- With and Margin for Error. The lesson then evolved into our first work on technique extensions vs. There is already written a lot about the movie "Life of Brian" from Monty Python, but after 30 years this movie is still up to date. And it is still funny as hell, to stay within the theme here. Like all good satires, it holds a mirror to society, it may be a little distorted to assert an absurd situation, but it is still an actual reflection. As you are all aware, due to the deadly Man Flu (which only attacks the male), I missed Christmas and New Year. Dee therefore decided to take me out of the doom gloom and snow ridden UK for a week of sea, sand, sunshine AND WAIT FOR IT.. The MALC'S first event in the UK was the brainchild of Mike Ilderton and Richard Matthews. Both Newcastle United supporters and supporters of the legendary Sir Bobby Robson whose brave fight against cancer has captured the heart of millions. We decided to hold a mixed martial arts festival to raise money for the Sir Bobby Robson Foundation.